I’ve been meaning to send you a few things that I came across that relate back to your Therese Part I post, and some of the ensuing debate in the combox about the relationship between doctrine/dogma and love. In my view, the two need not be opposed but should rather mutually reinforce one another, all the while maintaining, with Saint Paul, the priority on love: “if I have all faith so as to move mountains but do not have love, I am nothing” (1 Cor 13:2). This also relates to the topic in your same post about prayer, and how one doesn’t even need to believe in God to pray, which dovetails with the very complex topic of membership in the Church and what that means. 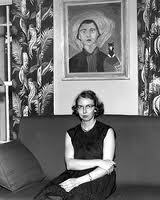 I'm heading into Flannery O'Connor RIGHT now. This is great food for the soul. Beautiful posts...again. Love that first quote from O'Connor. Exactly. 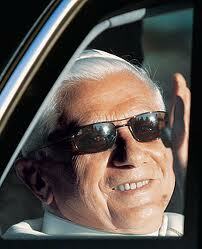 They swear that both of these Popes (and others) contradicted established doctrines of the Church. Also check out http://www.waragainstbeing.com/. This guy argues very intelligently why Ratzinger is in a war against being (as St. Thomas understood it). These guys are radical for claiming such things about Popes, but they are working right from what they consider the unchangeable dogma of the Church. I doubt Flannery would feel at home in their company. They seem to give the lie to Flannery's claim that "dogma...is an instrument of freedom and not of restriction." I passed a librarian reading Wise Blood yesterday and I congratulated her on a great reading choice! Yeah, that Andrew Matt is pretty darned amazing! Super-smart, learned, husband, father of two, and a huge broad-and-wide heart. I'm so glad you enjoyed his comments. To honor the tradition does not excuse one from the obligation of beginning everything from the beginning each time, not with Augustine or Thomas or Newman, but with Christ. And the greatest figures of Christian salvation history are honored only by the one who does today what they did then, or what they would have done if they had lived today. The cross-check is quickly done, and it shows the tremendous impoverishment, not only in spirit and life, but also quite existentially: in thoughts and points of view, themes and ideas, where people are content to understand tradition as the handing-on of ready made results. Boredom manifests itself at once, and the neatest systematics fails to convince, remains of little consequence. The little groups of those who have come to an understanding with one another and cultivate what they take to be the tradition become more and more esoteric, foreign to the world, and more and more misunderstood, although they do not condescend to take notice of their alienation. And one day the storm that blows the dried-up branch away can no longer be delayed, and this collapse will not be great, because what collapses had been a hollow shell for a very long time.